Preheat the oven to 425° F. Arrange the tortilla chips on a baking sheet. Sprinkle with about 1 cup of cheese. Add the black beans, chorizo, corn, and black olives. Add the remaining cheese. Bake for 10-15 minutes or until the cheese has melted. Meanwhile, combine the sour cream and taco seasoning until well blended. Set aside for serving. To make the eggs, whisk together the eggs, heavy cream and a pinch of salt. Heat a large skillet over medium heat and add the butter. Pour in the egg mixture and let sit, without stirring, for 20 seconds. Stir with a wooden spoon, lifting and folding the eggs over from the bottom of the pan. Let it sit for another 10 seconds then stir and fold again. Repeat until the eggs are softly set and slightly runny in places, then remove from the heat. They will continue to cook as they sit. 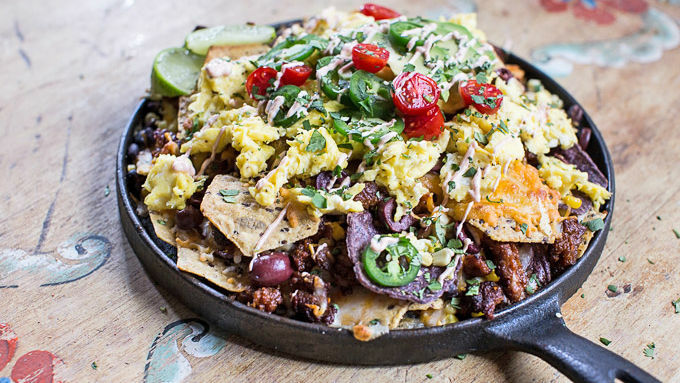 Remove the nachos from the oven and top with scrambled eggs. Drizzle with the sour cream mixture and serve with freshly sliced avocados and cherry tomatoes, cilantro and jalapenos. To make this recipe vegetarian, omit the chorizo. Try adding your favorite veggies and meats to the mix; the combo options are endless! Got morning guests? Try this fun way to entertain early in the day. 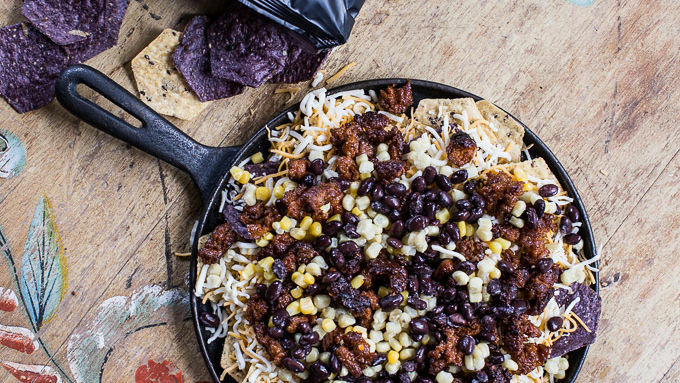 You know what could make nachos even better? Eating them for breakfast or brunch! Oh yeah… adding eggs and all the fixings to make them breakfast or brunch-worthy. I know what you're thinking—nachos for breakfast? One, that sounds kind of odd, and two, not all that balanced. But hear me out before you judge. 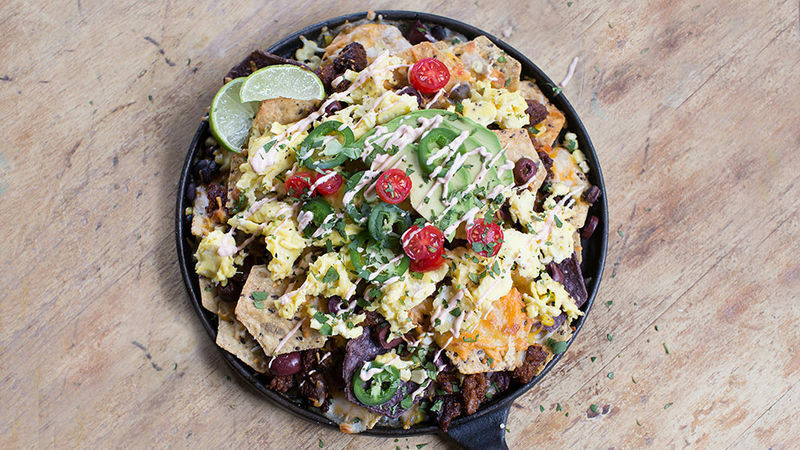 These breakfast nachos have protein, grains and veggies. A great way to kickstart your day! The base for these nachos are the crazy delicious Food Should Taste Good™ tortilla chips, which come in different flavors—blue corn, lime, multigrain and harvest pumpkin are just a few of my favorites. They’re also loaded with great ingredients like flax seeds AND they're gluten free. They're also, um, semi-addicting. Once you’ve picked your favorite flavor of chips, the rest goes pretty quickly. Just top with cheese, veggies, beans and olives. Bake in the oven and then add scrambled eggs, spicy sour cream and fresh toppings like avocado, cilantro and jalapenos. Totally my kind of breakfast!! What a great way to start your day!